We carry all the major brands in all the popular sizes & wattages. 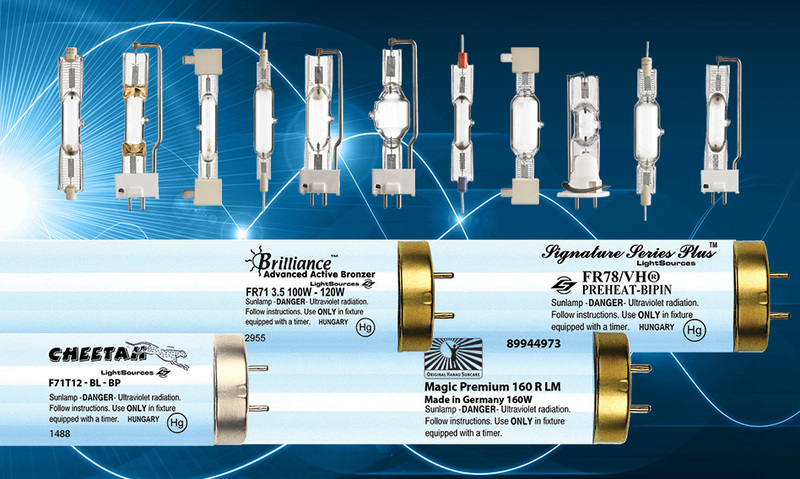 We have the lamps you need in stock for fast same day shipping. Ultraviolet Resources International was established in 1986 in Cleveland, Ohio and is currently located in prestigious Westlake, Ohio. We are the largest single distributor of indoor tanning lamps to commercial sun tanning salons, and one of the top overall tanning product distributors serving the US market. With our combined 68,000 sq ft of warehouse space, we are able to inventory what every tanning salon needs. In 2016 Ultraviolet Resources acquired the lotion division of Suntan Supply located in Sauk Rapids MN, and also acquired the tanning lamp division of Interlectric Corp of Warren, PA. These acquisitions allow us the opportunity to better serve our central and west coast customers in a more timely matter, while also increasing our various product lines. URI continued its growth in 2018 by acquiring the lotion division of Future Industries in Milford, CT. We were thrilled to include additional experienced sales staff for our vast variety of representatives located throughout the country. We pride ourselves with a knowledgeable staff that has over 250 years of combined indoor tanning experience. Ultraviolet Resources has grown and adapted to many industry changes. Dedicated to providing superior service by anticipating our customers’ expectations, we are able to swiftly respond to your needs. Striving to stay ahead of the competition, we offer the latest lamp technologies in both high and low pressure applications, the latest in premium quality tanning lotions, sunless products and many “must have” salon accessories. The best service, knowledge, price, quality, and technology all from one supplier with two great locations...URI. Your orders will be processed fast and secure with many payment options to suite your needs. We're not afraid to talk to you. Need help or prefer to place your order over the phone? Contact Us at 1-800-247-3251 Thanks for shopping at URI!